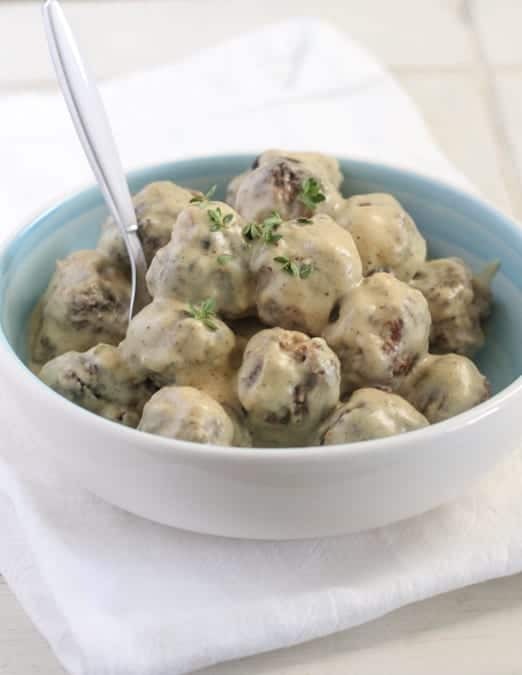 My Homemade Party Meatballs with Sweet and Spicy Mustard Cream Sauce are perfect for summer entertaining! Thrilled to share these fun party meatballs with you today! 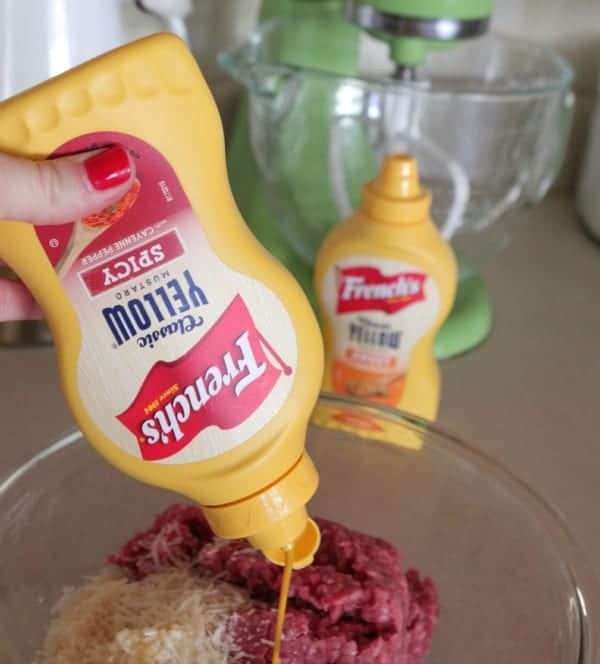 I’ve partnered with French’s Mustard to bring you a new appetizer that will be the hit of the party. 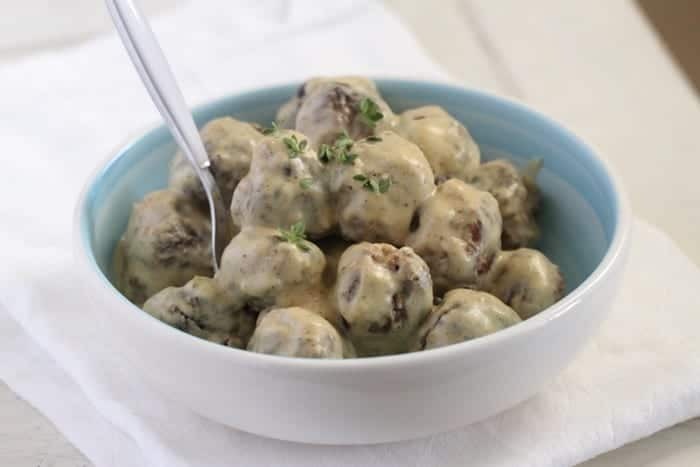 Flavorful bite size meatballs with a mustard cream sauce that pops with sweet and spicy notes. So excited to share these two new mustard flavors with you today! 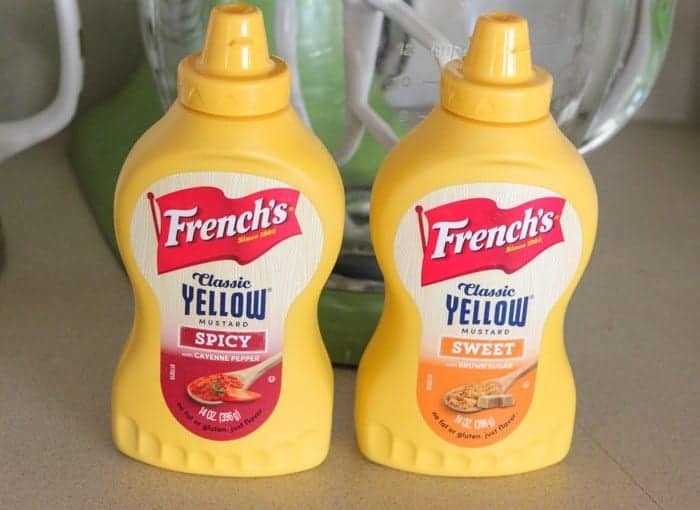 French’s Spicy Mustard with Cayenne Pepper and French’s Sweet Mustard with Brown Sugar. The flavor possibilities are endless, perfect for something sweet, spicy or a little of both! 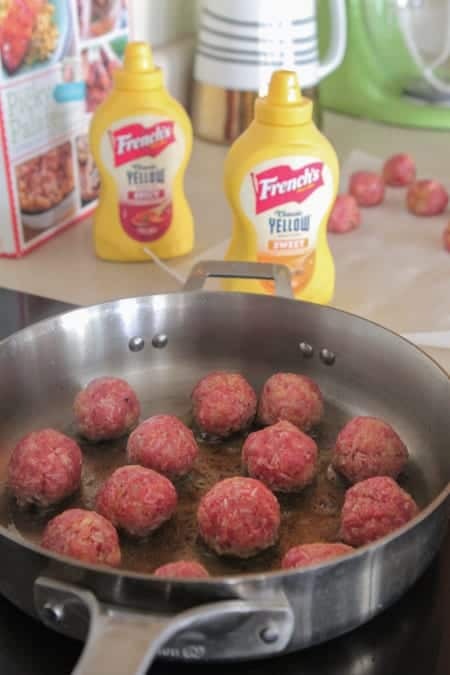 I love that French’s isn’t just for hotdogs and hamburgers, its perfect for bringing amazing flavor to everyday cooking such as my meatballs and mustard cream sauce. Crafted with only simple, quality ingredients, including stone-ground #1 mustard seed, French’s Classic Mustard has been America’s best-loved mustard for more than 100 years. Place your beef into a large mixing bowl. Add your ingredients into the bowl. 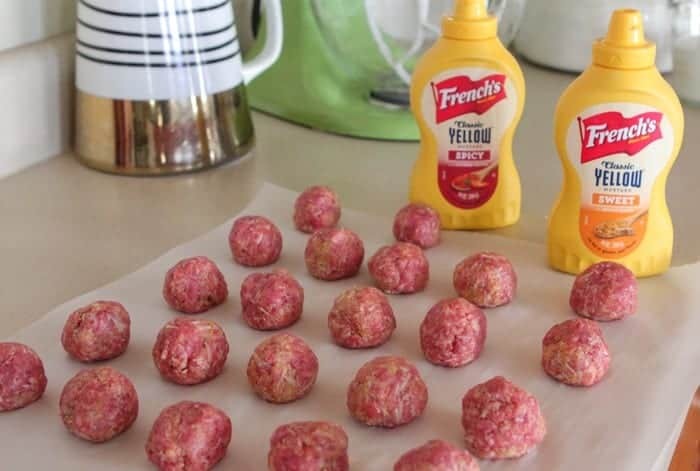 I added French’s Spicy Mustard for a nice little kick to the meatballs. Gently stir all ingredients together. Mix until just combined. Take about 2 tablespoons of beef and roll into meatballs. Heat 3 tablespoons of oil into a large skillet over medium heat. Add meatballs in batches, browning all sides. 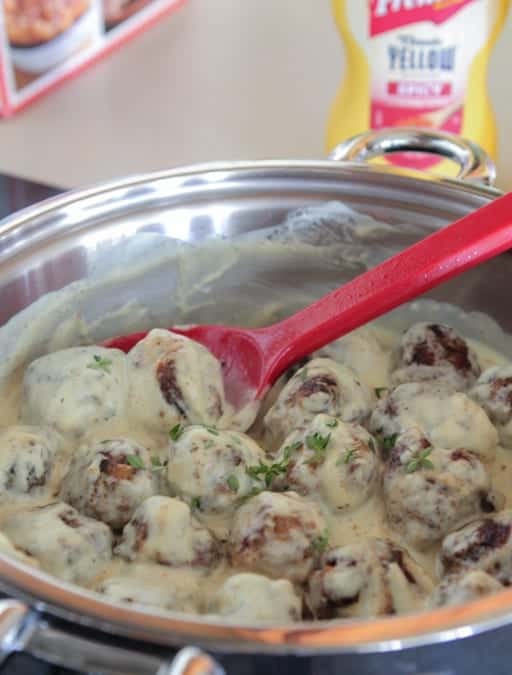 Prepare your mustard cream sauce while the meatballs are browning. 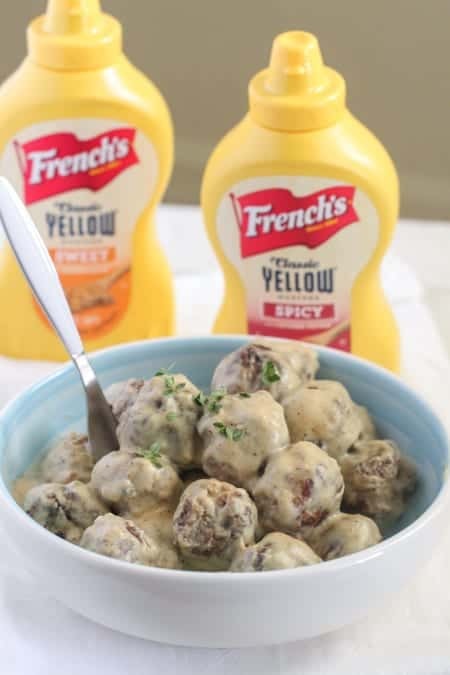 You’ll use French’s Sweet Mustard and Spicy Mustard that makes the perfect sauce over your meatballs. Remove meatballs from pan, carefully pour hot oil from pan. 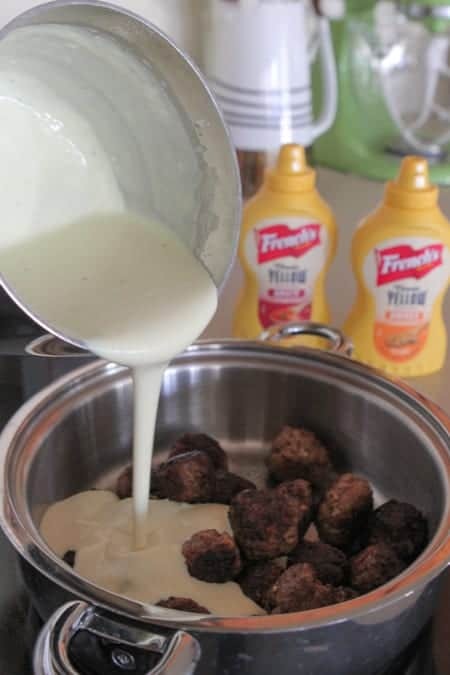 Add meatballs back to skillet and pour in the mustard cream sauce. Add a few pinches of fresh thyme and now it’s time to enjoy! Perfect for snacking on with a fork, or great served with a side of pasta. Heat olive oil in large skillet over medium heat. 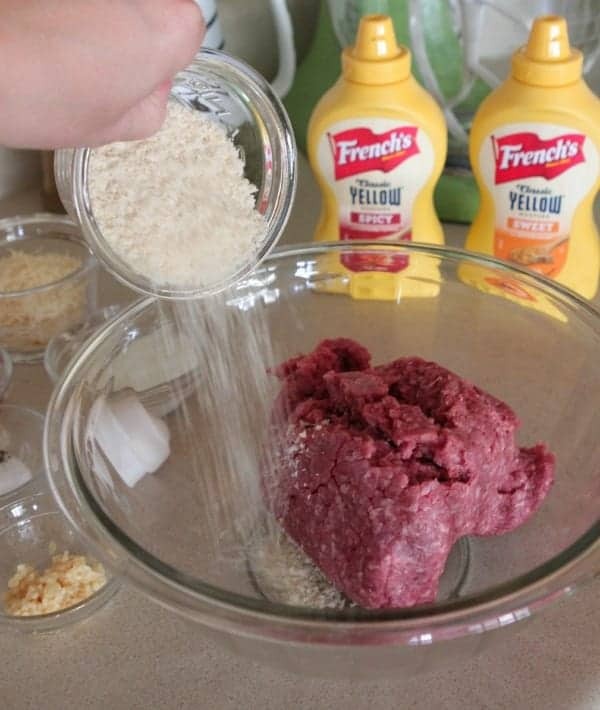 Place ground beef into a large mixing bowl. Add Panko, Parmesan, salt, pepper, egg, milk, mustard and hot sauce. Gently mix until combined. 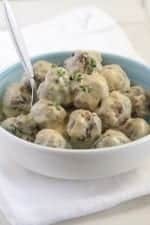 Take 2 tablespoons of meatball mixture and roll into balls. In batches, add meatballs to hot skillet, browning all sides, about 5 minutes. Removed meatballs. Remove oil from skillet then add meatballs back to skillet over low heat. 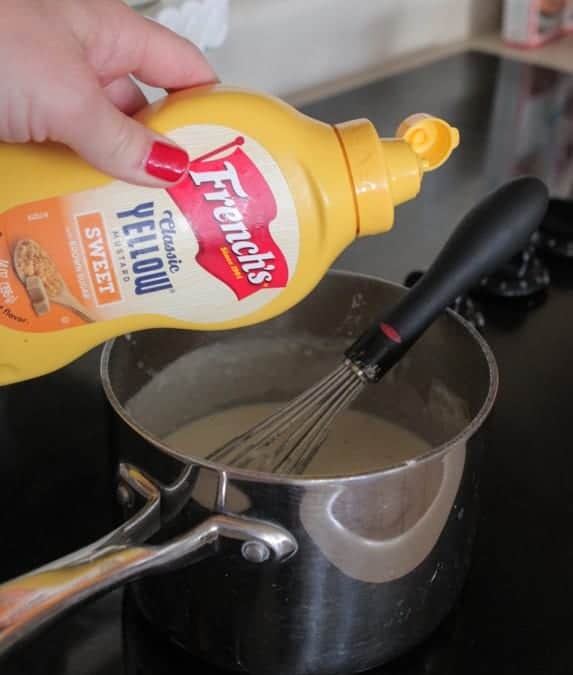 To prepare mustard cream sauce, place butter into medium saucepan over medium heat. When melted whisk in flour, salt and pepper until thick and bubbly. Slowly whisk in half and half cooking until thickened. Whisk in mustards and chicken broth until smooth. Pour sauce over meatballs. Garnish with fresh thyme leaves if desired. Serve immediately. Sauce thickens as it simmers. As needed, stir in additional chicken broth to loosen sauce. Oh I love that mustard sauce! Sounds very delicious! 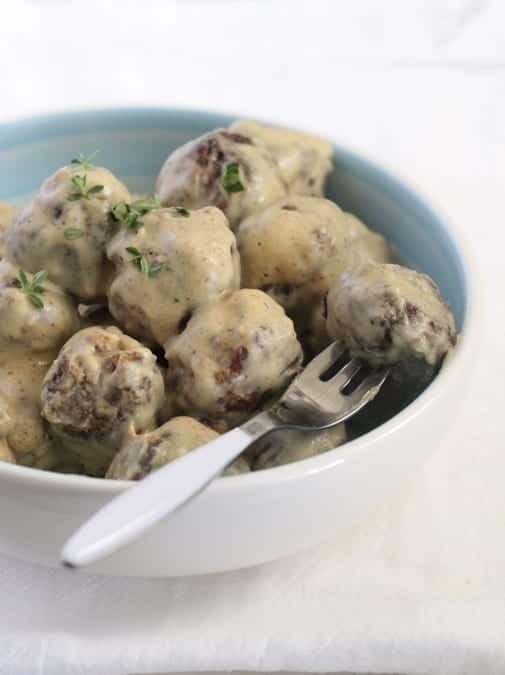 These meatballs look amazing, and it is a nice change to have the mustard sauce as opposed to the sweet style sauces that usually accompany meatballs…thank you! These look wonderful! A mustard cream sauce is something I could definitely get into. This is so goofy, but I love the French’s Mustard commercial on TV right now. I could watch it again and again. On the list to make this week! I’ll never pass up a good meatball! I can see these meatballs on a big crunchy bun with a crunchy slaw for my husband and I like how you used both the spicy and sweet mustards in this bad boy. Game on. Sounds and looks delicious. Thank you and have a great Wednesday! That sauce sounds absolutely amazing, Jenny! What a fun dish for parties or weeknight meals. We go through mountains of meatballs here but usually always with marinara, I need to try this sauce! These look so good – pinning! These look so easy and I bet they taste awesome! I love sauces that include mustard! I’m so saving this recipe for my husband. He LOVES mustard more than most things! Oh boy I could eat a giannnnnt bowl of these! They look perfect! Holy cow! I would definitely eat more than one serving of these! That sauce sounds amazing! This looks incredibly delicious! Sweet and spicy is the perfect combo in my book! 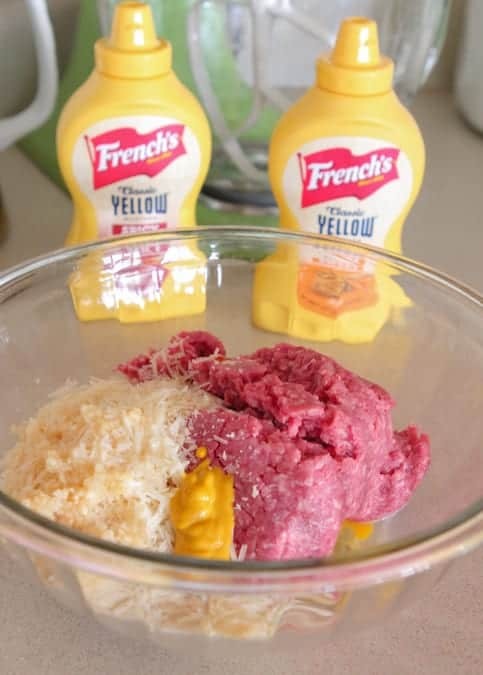 I had no idea French’s made flavored mustard. I need to get all up in these meatballs…ASAP! Pinned. These are definitely perfect for a party! Love that you can go sweet OR spicy! I adore meatballs so much and that sauce looks to die for!! The sauce on these meatballs looks so delicious! Love these! These sound so great! Pinning for a party! Excited to try these new mustard flavors! How fun 🙂 These meatballs look great! I’d be drawn to this at a party! Yum! I could def eat an entire batch of these! I love how you used a mustard sauce on meatballs!! 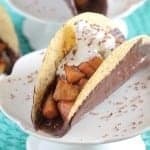 What a fabulous and delicious idea! Excellent-looking meatballs Jenny! Loved your mustard bechamel sauce, especially since it contains chicken broth as well! Regarding Panko breadcrumbs, we don’t have those here in Greece, is this coarse crumbled bread? Could we use that instead? If yes, do we have to soak the bread first or is it used as is (dry)? Thank you very much for a beautiful, delicious recipe!